Electric wall heaters are a must-have for many environments. Whether you need additional heating for a cooler building, or if you want to install a powerful heater that will not take up floor space, an electric wall mounted heater may be the choice for you. These heaters usually have a good heat output capacity and can heat an area efficiently and quickly. There are many designs of this style of heater with their own features and advantages, so read this useful guide to find which one is best for your needs. You can choose which heater you would prefer, depending on your budget and your individual requirements. 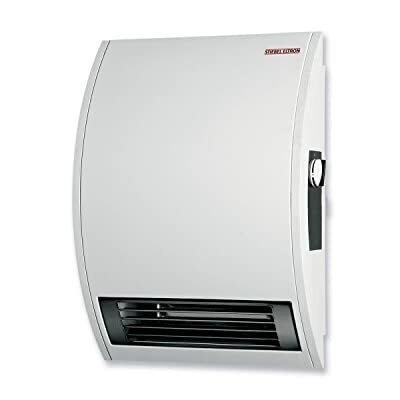 We have included some helpful information with our best electric wall heaters reviews so that you can find out which are the best heaters on the market, whilst our useful guide to the end of this article will help you to decide what features you should be looking our for when you are choosing a wall heater. 2 How to Choose the Best Electric Wall Heater? If you’re looking for a fast and convenient wall mounted electric heater, the Stiebel Eltron CK 15E is a good choice for many home and business users. You can use this heater in places like bathrooms, kitchens and hallways to add a fast, efficient and safe amount of heat when it is required. This heater has a surface mounting design. The heater itself is easy to install, an as long as you are confident with tools, you should be able to install this wall mounted heater yourself without needing to calla professional. You can easily replace an old heater with this one if necessary. If you want to save space or if you simply want a heater that is low profile and not too obvious, then you’ll like this heater. It is small and compact and has a special downdraft design that is great for warming floors that are usually uncomfortably cold. This is a quiet wall mounted heater that will not disturb the usual ambience of the room that you are installing it into. If has a highly durable build construction that allows you to enjoy this heater for many years without fear that it may stop working. There is an integrated thermostat so that you can control the temperature of this heater. This is one of the best mounted wall heaters available. 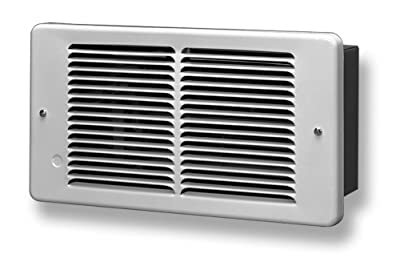 The heavy 20-gauge steel construction of the Broan 174 heater body and the louvered grilles ensure that you can enjoy full safety and even heat distribution. To the front of this heater is the adjustable thermostatic dial. This allows you to easily control the operating temperature of this heater. The color-coordinated design of the dial makes it easy to understand and operate. This heater has been factory wired and can be converted from 1500-watt power to 750 watt, depending on the heat distribution that you require. To make this unit as easy to clean and maintain, the whole of the heater assembly can be taken out of the steel housing. Whether you clean it yourself or if you choose to take it to a professional, you can be sure that this heater can be easily and effectively maintained for longevity. The alloy metal heating element is durable and can create heat in no time at all. Within seconds of firing up this heater, you will notice that your room starts to heat up. The heater element design ensures efficient operation to allow your energy bills to stay as low as possible. This is a one of the best wall heaters to choose with many desirable features. For a heater that can provide comfortable warmth to any space, check out the King PAW2422. This wall-mounted heater can offer you a range of great features that you may not get with inferior models. A 20 gauge powder coated grill at the front of this heater makes it as safe as possible. It has contemporary fie formed corners that are rounded and this outer body protects the multi wattage element within. The steel fins at the front of this heater ensure that the heat is distributed in a downward motion so that the room may be heated from above. This allows you to place the wall mounted heater at a safe height so that it can’t cause injury. An integrated thermostat allows you to control the heat output of this heater. The design of this heater allows it to fit comfortably anywhere and the quiet operation will not disturb the usual noise levels of the room. For complete peace of mind, this heater comes with a 2-year warranty on all pats. You can be sure that if anything goes wrong with this heater due to manufacturer’s error, you will be able to get it fixed. 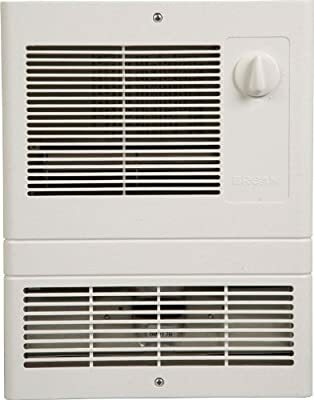 As this heater is so durable and has such solid construction, you can be sure that after the warranty period is up, this heater will continue to last. The Broan Model 9815WH is a powerful 1500 watt heater that can be easily wired for 120 volts or 240 volts at the point of insulation. The thermally protected motor is powerful yet quiet, and comes with transverse blower operation. A built in thermostat allows you to alter the working temperature of this heater with ease. This heater is aesthetically pleasing as it has a white grille to the front. Not only does this add an interesting feature but it is also strong and protective. You can be sure that it will encase the motor and blower for the safest possible operation. So that you can install this heater as quickly as possible, it has effective hang tabs. These tabs allow you to screw the heater to the wall securely, and installation is so simple, that as long as you have an electrical feed near where you want the heater to go, you can easily install this heater yourself. The construction and design of this heater means that heat is directed in a downward motion and circulated effectively around the room. Within minutes of turning on this heater, you can enjoy a curtain of heat that is sent downwards, circulating around the room. 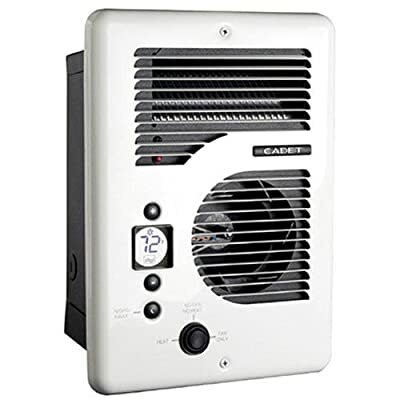 The Cadet CEC163TW is a great electric wall mounted heater that has a user friendly design. A large and backlit display allows you to see instantly the current settings and temperature for this heater so that you can use the digital thermostat to alter the heat output depending on the environment. The large display allows you to see the test more clearly. You can make precise adjustments to the temperature of this heater without needing to reach for the manual, as it is so easy to operate. You can alter the speed of the fan, and thanks to this feature, you can effectively turn down the volume of the noise that this heater produces. This heater can offer you very quiet operation. To maintain optimal comfort, this heater can intelligently alter the fan speed, depending on the temperature of its environment. This way, you can enjoy a reliable and constant temperature in your room. This heater is so precise that it can maintain the temperature of your room within one degree. You can be sure that you’ll have complete comfort and convenience when you choose this heater for your home. The robust design of this heater also means that you can enjoy reliable operation for many years. 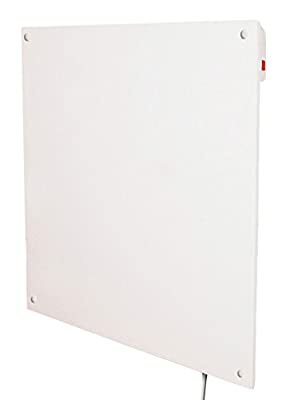 The Amaze-Heater 400 Watt is a one of the best bathroom wall heaters on the market and it comes from the company that was the first to offer a 600-watt sized heating panel. The heating element in this heater is completely encased by the robust and protective housing. This makes the Amaze-Heater 400 Watt safe to be used in environments where there may be children or pets. To give this heater additional strength when it comes to impacts, it features fiberglass mats. These mats are layered in each panel of the heater and also provide insulation against heat loss. You can be sure of complete safety when you choose this hearer as it has the ETL approval of US certifications. This heater has also had to pass rigorous testing and has a hand finished design to eliminate any factory created problems. This heater comes with clear instructions to enable you to install it for yourself. If you are confident enough, you can use this heater in no time, thanks to the quick and simple installation. Of course, you can choose to have it installed by a professional if you wish. This is a safe and economical wall heater that is easy to operate and can provide efficient convective air currents to any room. How to Choose the Best Electric Wall Heater? Choosing an electric wall heating wont be a difficult task if you use our useful tips here to make sure that you choose the features that matter most to you. Where do you want to install the wall-mounted heater? Some heaters are better than others at distributing heat downwards. If you want to install your wall heater particularly high up, you should ensure that it has downward facing fins or grilles so that it can force the warm air downwards. As warm air rises, this is especially important. A good blower fan will also assist in forcing the air downwards, and this makes the heat circulate around the room. You should think about the size of the room that you want to heat. You can purchase all sizes of wall mounted heaters, and some are small enough to comfortably heat a room in your home, whilst others are made to be more industrial and large for much larger spaces. If you choose a heater that is too small, you will find that it doesn’t heat the room effectively and you will simply waste energy. A heater that is too large will also cause you to waste energy as it will provide too much heat to your room and you may need to open the windows to achieve a more comfortable air temperature. There are many different features that heaters come with for setting the temperature. You can choose from digital thermostatic controls or dials and different heaters offer different levels of accuracy. You should decide how accurately you wish to control the temperature of the room. You should try to choose the electric wall heater that has the longest warranty for your own peace of mind. Wall heaters are usually very robust and can usually stand the test of time, however if something should go wrong within the first year or two due to manufacturer error, you will be able to have the heater fixed or replaced if it is within its warranty period. Before you install the heater, you should make sure that you have sufficient electrical provisions to your room. You may need to add an additional fuse for the new heater so that it won’t overload your current circuit. You should remember that electrical heaters require a large amount of power to create the heat that is required. Another thing that you should check before a wall mounted heater is installed is that your wall can support the weight of it. Wall heaters have robust designs, but this also means that they are often heavy. You should ensure that your wall can bear the weight of the heater. It is not usually suitable to install a wall mounted heater on a studded wall or a non-load bearing wall unless it has been reinforced in some way. If you are unsure, you should check with a qualified professional. When you are installing your wall heater, you should be sure to install it away from any furniture that may be in the room. Look out for nearby drapes or blinds, as these can be hazardous. You should also take care with any new furnishings. You should try to keep the space below the heater as clear as possible. Be sure to place your wall heater away from any fuels that could cause a fire risk. Whilst electrical heaters are safe, they do produce a large amount of heat, and this can be dangerous for any flammable fuels that may be nearby. Try to get your heater serviced regularly, especially as it begins to get older. Ensuring that the heater is working properly not only prolongs the life of the heater, but it can also give you peace of mind that the heater is operating safely. Any problems that may arise from a faulty heater could affect other appliances on the same electrical circuit. There are several pros and cons when it comes to choosing a wall mounted heater. You can enjoy the convenience that comes with a wall mounted heater as you can enjoy instant heat. When you turn on the heater, within seconds, the element is heated and the blower will provide you with a curtain of warm air. The alternative is to use a central heating style system, that not only takes forever to get warm, but it also uses an unnecessary amount of energy when you only need to use one room. This spot heating is much more effective than a central heating system therefore when you want to add instant heat to just one room. You will lose a lot less energy with a wall-mounted heater in comparison to a central heating system. A central heating systems has a lot of external venting, not to mention the times when you heat a whole building when you only need to use one room. 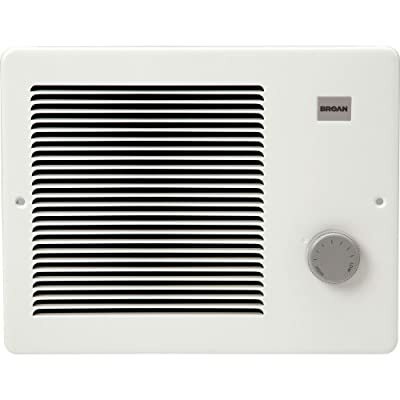 A wall mounted heater delivers hot air to the room when you need it without wasting any. Instead of having an external ventilation system, it will blow the heat around the room, allowing it to circulate. You should not however that an electrical wall mounted heater is only effective if you choose the right one for the size of room that you have. If you have a heater that is too large, you will find that you create unnecessary heat. If you ever open a window in the room whilst the heater is on, this will mean that you waste energy. A heater that is too small for the room may mean that you need to add an additional heater when it is particularly cold or even use the wall mounted heater in conjunction with a central heating system. Installing an electric wall-mounted heater doesn’t have to be a daunting task. Just follow this guide for some helpful tips. First of all, you need to make sure that you choose the heater that will provide you with the heat that you need in your room. Too much heat and it will be wasted, too little heat and it wont be sufficient. You should make sure that you choose a location in the room that is clear of any obstructions. You should avoid placement near any drapes or furniture that could cause a hazard. Also keep the heater away from any combustible fuels or clothing. Make sure that the electricity supply is sufficient fro powering the heater. If you don’t have the correct electricity provisions, you may find that the heater draws too much power and this can result in damaged appliances on the same electricity circuit, blown fuses, and even fires. Once you have chosen the wall that you want the heater to be fixed to, you should make sure that it is strong enough to support it. If it isn’t, it could fall off the wall, causing damage and even injury. To avoid this, make sure that you only fix the heater to a strong, brick wall. If this isn’t possible, you should make sure that the wall is reinforced by a qualified professional. Install the heater high enough so that it cant cause injury to anyone below it, and make sure that it is away from any electrical features such as light fittings. Make sure that you choose the right voltage for your electricity supply when you are wiring in the heater if they have a multi voltage operation. Some heaters are easy to install and can be mounted by a confident homeowner whilst others require more expertise and should only be installed by a professional. Electric wall mounted heaters are a great choice when it comes to heating small amounts of space. As you can see from these best electric wall mounted heater reviews and guide, choosing the best heater for your needs doesn’t have to be a difficult task. Of course, these heaters can be dangerous if they are not installed properly, so safety should be paramount at all times, but with a little common sense, you can safely add one for commercial or residential use. You can not only add convenience to your room’s heating, but you can also save money in the long run by not needing to heat the whole building when only one room is in use. This and many more great advantages make wall mounted electric heaters a must-have for many consumers. For complete peace of mind, you can find many heaters that offer you a warranty too so that you can be protected against manufacturer’s faults.